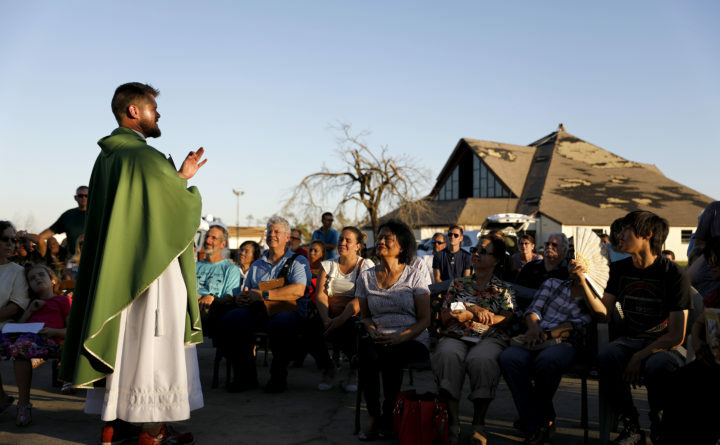 Father Michael Nixon holds Mass Saturday outside Saint Dominic Catholic Church which stands damaged in the background form hurricane Michael in Panama City, Florida. MEXICO BEACH, Florida — Search and rescue personnel are continuing to comb through the ruins of a small Florida Panhandle community destroyed by Hurricane Michael, which has left hundreds thousands without power and without easy access to supplies. Michael made landfall Wednesday as a Category 4 hurricane with 155 mph winds and heavy storm surge. The tally of lives lost across the South stood at 15, including the victim found in the rubble of Mexico Beach, where about 1,000 people live. “I’m the idiot that rode it out here in this place,” Blackwell, 65, said, sweat dripping from his face. He doesn’t plan to leave; he wants to protect his home from looters. Associated Press writers Russ Bynum, Brendan Farrington and Gary Fineout contributed to this report.